Last night, awards season came to an end, and with it our endless opportunities to see Natalie Portman’s growing baby bump, Helena Bonham Carter’s inspired reaction shots, Melissa Leo’s always-on-the-verge-of-going-off-the-farm acceptance speeches, and, saddest of all, Darren Aronofsky’s endless parade of scarves. See, the Black Swan director is a scarf man, meaning, a man who wears scarves. He has been a scarf man for many years, and, one assumes, will be one for many more, but these past six months — since Black Swan premiered at the Venice Film Festival at the start of September — have been a climactic stretch for his look: Scarves are one thing when you wear them with T-shirts; they reach the next level when paired with $10,000 suits. 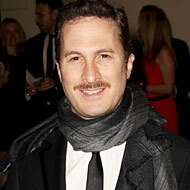 So please, check out Aronofsky’s bold sartorial experiments with gray neckwear, and ponder just how sharp he would look in an ascot.